Calling card of Florence Tufts Clark of New Sharon, Maine. Florence Tufts was born February 9, 1865 at Farmington, Maine, daughter of Warren Tufts and Martha Ann (Tarbox) Tufts. 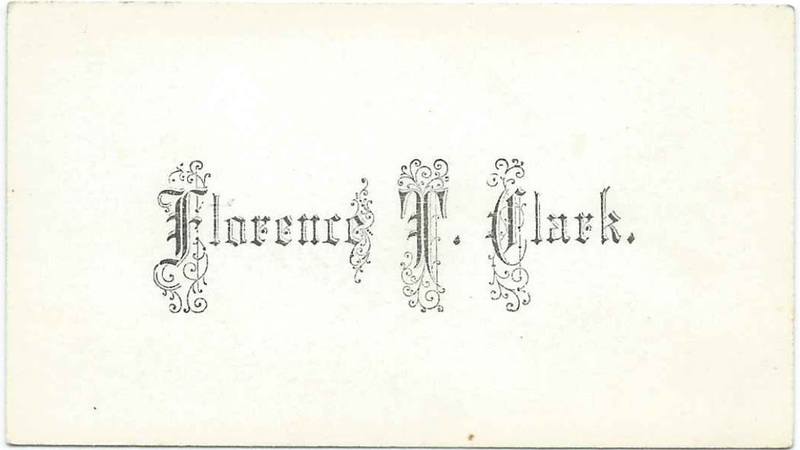 As noted in a History of the Town of Industry in Franklin County, Maine, Florence was adopted by Starling Clark and Palona (Tufts) Clark. On March 13, 1885 at Farmington Falls, Maine, Florence married George Howard Allen, son of Benjamin Allen and Eliza Ann (Coombs) Allen. See another post that features the calling card of George Howard Allen.